You can see the nominees for a great price! PHOENIX — The nominees have been announced! So, the next question is: how many of the " best picture" films have you seen? 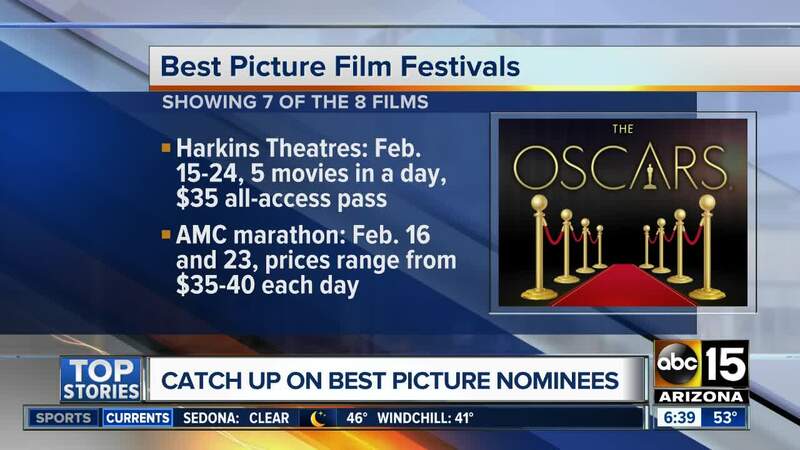 If you have some catching up to do before the 91st Academy Awards (they air Feb. 24 on ABC15, by the way), Harkins Threatres is hosting a " Best Picture Film Fest " where seven of the eight nominees will be shown at theaters around the Valley. Netflix's Roma is not part of the festival because it "not licensed for wide release in our theatres," Harkins said. However, it is available to watch on Netflix. For $35, movie-goers will be able to see BlacKkKlansman, Black Panther, Bohemian Rhapsody, The Favourite, Green Book, A Star Is Born, and Vice between Feb. 15 and 24. Five movies will be shown each day. You can view the schedule, here . You can purchase a pass, here . The cost breaks down to $5 per movie. Considering Harkins individual movie tickets range from $7-$11, there is some savings there. Still, candy, snacks and soda are extra. Those who sign-up for Harkins' rewards program, which is free, and buy the pass, will receive a $10 credit that can be used toward concessions, such as snacks, candy and soda. Seats can be reserved online. AMC is also hosting a " best picture showcase ." It will screen seven of the Best Picture nominees (it is also not showing Roma) over two days. On Feb. 16, guests will watch The Favourite, BlackKklansman and Bohemian Rhapsody back to back (a total run time of 7 hours and 15 minutes). On Feb. 23, the lineup switches to Vice, Black Panther, A Star is Born and Green Book (a total run time of 10 hours and 38 minutes). Admission per day varies between $35-$40. AMC Stubs A-List and AMC Stubs Premiere members will receive $5 in bonus awards per day. There is also a 24-hour marathon, but no Arizona AMC theatres are offering that option. Once you see the movies, tune in to ABC15 on Sunday evening, Feb. 24 to watch the Oscars and see who takes home the top award.